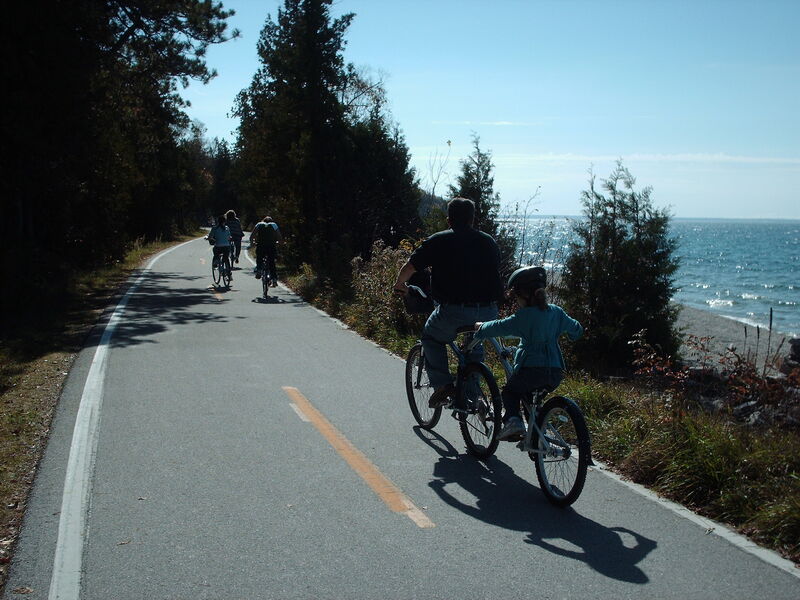 Road Track and Trail | All things cycling in Michigan's Thumb. I can’t believe it’s been so long since I wrote anything here. I guess I didn’t know how many different ways to say “I’m still riding my bike”. I have done something a little differently in the past few weeks. Every other day I added weights to the workout. I am definitely noticing a difference in my thighs. I started with too much, though, and had to rest until I could walk again. 😉 Now, I’m adding a little more every day and I can tell a little difference already. Still haven’t lost any more weight, but I’m not quitting. Can I be honest, though? This is not fun and games for me, yet. I’m hoping, based on other blogs I read and fb friends’ comments, that it will become so. At this point, though, it’s HARD WORK…EVERY DAY. Don’t kid yourself that just because Susie Q lost 100 lbs in a few months and now looks like a Victoria’s Secret model, that will happen to you. So, I’m not sure where you are (is anyone out there? )w/your fitness goals, but I hope you will come back and help me stay accountable. I know just knowing I have to write about this is what keeps me getting on the bike some days. Plus, my asthma is definitely better than pre-biking days. So I will keep riding. What about you? and really enjoying it. I guess I’m still not to the place where I would like another model better. 😉 I do need to at least switch, though, to give the next model a try. Not sure which one I’ll try next. If you have any suggestions, feel free to send them my way. I have been exercising at least 4 times a week, at an hour each time. For the past month I’ve been keeping track of everything I eat and cut way back on my calorie intake. Still, the net loss has only been 9 pounds. I have to say, that’s a little discouraging. I read about and hear about all these great weight loss accomplishments. I always figure I must be doing something wrong. However, exercising an hour almost every weekday and eating less is a good life plan anyway, so I’m going to keep going with it. Something happened today, though, that was VERY encouraging. I ordered some new jeans online and accidently ordered a size smaller than I normally get. THEY FIT!! That felt really good. So, I may not be losing weight like I think I’d like, but I must be doing something right. I feel better and went down a size. WOOT!!! These days, since there’s snow on the ground, I ride inside every time. It’s not quite as refreshing exercising indoors, but it beats getting out of the habit, yes? I am, admittedly, new at this. I haven’t felt that I was up to riding for a long distance until recently. So, Saturday, a friend and I decided to try out the Southern Links Trialway from Millington to Columbiaville. It is an enjoyable ride. I only wish I could have seen it when the leaf colors were at their peak. Even without leaves, it goes through some beautiful country….fields, trees, ponds, etc. The trail is 10.1 miles one way. We both thought that it was a little harder riding to Columbiaville than back to Millington. Perhaps the wind behind us on the way back made a difference. Warning: many of you know it is gun season here in MI now. While we were riding on Saturday, we heard people siting in their guns. I would definitely wear BRIGHT ORANGE if I were going to take this trail right now. If you get a chance to ride the Southern Links Trailway, let me know what you think. Got any other suggestions for trails to try? I’d love to hear from you. Fitness update: I’m up to 45 minutes a day on the CycleOps. I haven’t noticed a huge drop in my weight, but I feel a LOT better already. Okay, let’s get the particulars out of the way first. I have been riding, but not as much as I should have, I know. I spent the weekend in Detroit and couldn’t take the bike with me, so…I missed a few days. However, I’m back on the bike and my goal this week is 40 minutes of good, hard riding every day. So far, so-so. Now, the last thing I wanted to talk about really has nothing to do with cycling, but does have to do with blogging. There is a contest sponsored by One2One Network for next year’s Blissdom Conference. They can probably read this blog to see why I’d like to go to Blissdom this next year. I have been involved in social media for several years, but never really did much blogging until now. I have learned a lot, true. But, there’s still so much more I need to learn. Plus, I just would love to be able to meet other bloggers, exchange ideas, get helpful tips…and just visit IRL. Back to our regularly scheduled program. This weekend, I’m hitting the Southern Links Trialway with a friend. Can’t wait. I’m hoping to get some video, too, so I’ll have that here next week. Where are you biking this week? Got any great shots to share with us? 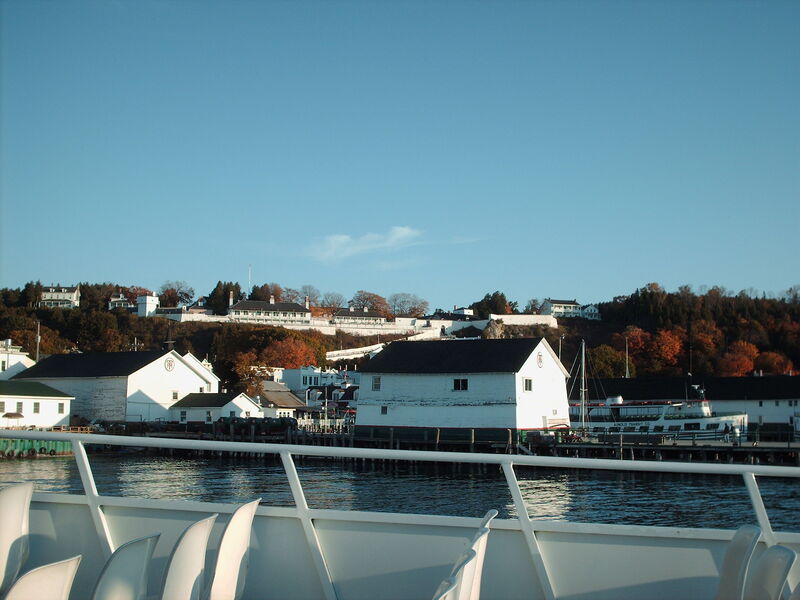 Three Sundays ago, we had the privilege of taking the whole family to Mackinac Island for the day. My husband was working on a log home for Barna Log Homes, Inc., so we hitched the in-laws’ pop-up camper to the truck and went with him. He worked while we relaxed on the shore of Lake Michigan. Actually, at this point he was only doing the tile, so he had some down time to relax with us. We spent three nights at the Wilderness State Park. 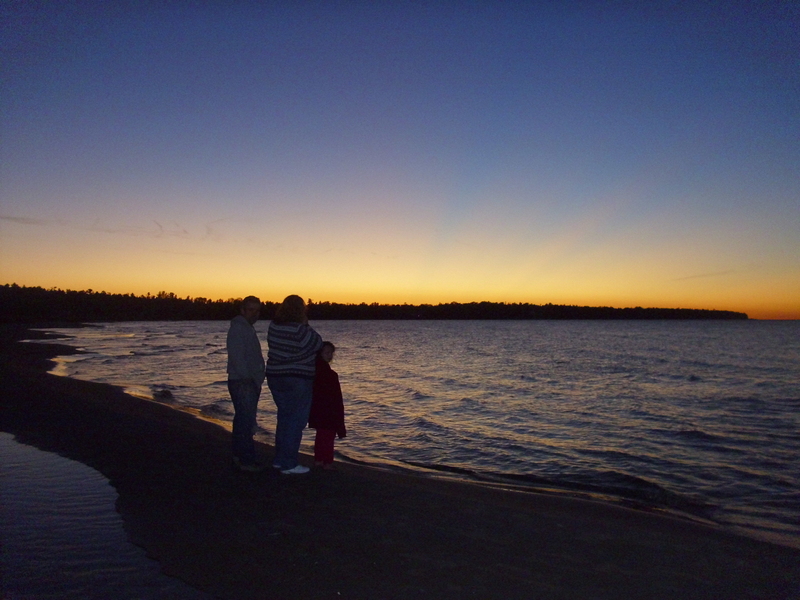 I was surprised at how many great campsites were still available when we got there. We were able to get a site right on the water. The highlight of our trip was spending the entire day Sunday on the Island. We took the 8:30a ferry from the Shepler’s dock in Mackinaw City. Great people…great service!! We were able to catch the morning service at the Mackinac Island Bible Church. Then, after the service ended, we headed back to the Mackinac Island Bike Shop to get bikes for the rest of the family. I actually brought the hybrid I had with us. Of course, we were thrilled they carried Trek’s. We were even able to get a tag-along for the 7yo. The weather was amazing and the fall colors absolutely breathtaking. The trip around the Island is 8 miles long, but it didn’t seem that long at all. At some points along the trail, people have stopped and stacked rocks. There were a whole bunch of these stacks. It was very interesting to see them. I’m still researching the story behind these rock stacks, so I’ll have to post an update later. After we returned our bikes, we walked around seeing the various shops on the Main Street. Of course, we had to stop at Murdick’s Fudge Kitchen and let everyone pick their favorite. Mine will always be maple walnut. I didn’t feel TOO guilty. After all, we did ride at least 8 miles that day. 😉 After choosing various trinkets in some of the shops, we headed back to the Shepler’s dock to take the ferry back to Mackinaw City. If you like a casual ride, this is a beautiful ride to take, especially in the fall. I highly recommend making the effort to see the Island. Today starts my two week stint with the Sport Comfort model from Trek. I am now riding a Navigator 2.0. I have to say that I love this bike. I am told that when I’ve been riding for longer, I will want the hybrid back, but for right now, this is the bike for me. Comfort is the best word, because I am much more comfortable on this bike. I’m not sure how much has to do with the bike itself and how much has to do with the fact that I’ve been riding longer. It gets dark early now, so I’ve been using the CycleOps trainer most of the time. I’m not prepared for riding in the dark at this point. This past Friday, I also got my first bike helmet. Leo was NOT happy I’d been riding without one, but I did point out that I ride with the trainer a lot, so that helped a little. Personal experience has taught me how important helmets are. My nephew died from a head injury sustained when he fell from his bike. He was 20 at the time. So, I promised Leo I’d be better about wearing the helmet when I ride. On the up side of all of this…I can tell the exercise is paying off in my breathing (asthma getting better, actually) and leg strength. I still don’t go for as long as was first suggested, but I am riding a little longer every day and feeling not quite as dead as I did at first. That’s a good thing. Who knows? Maybe I’ll be in shape to ride in the WAM for Team Mariah next July. WAM(Wish-a-Mile) is put on by the Make-A-Wish Foundation of Michigan. Time will tell. It’s 300 miles, so I’ve got my work cut out for me. The longest I’ve ridden so far has been 8 miles at one time. I’ll keep you posted. The past few weeks have been a little crazy. In my last post, I shared what happened with my mom. I was thinking I could still post, as she has internet. Turns out, the joke was on me. Her computer died because of a power surge. The next week wasn’t much better. Then, we went up north for the weekend, but I’ll talk about that in another post. Finally, got back from vacation, getting the laundry done and house picked up and broke my toe yesterday. Apparently, I’m not meant to exercise. But I did anyway. Did a half hour today on the CycleOps and the toe’s fine. 🙂 I’m back in the saddle and happy to be so.